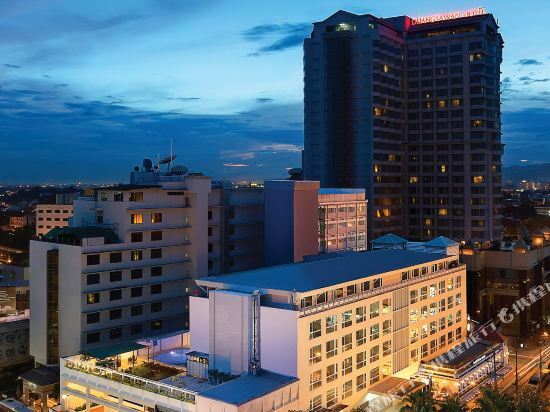 We’ve found great deals at 1789 hotels! Lotus Hotel Pang Suan Kaew Chiang Mai Situated in central Chiang Mai City, hotel is a few minutes’ walk from the famous shopping street Nimman Hemin Road, and it also near to Chiang Mai City’s Saturday and Sunday Walking Streets and Chiang Mai International Airport. Lotus Hotel Pang Suan Kaew Chiang Mai directly connected to Kad Suan Kaew shopping complex. Spacious air-conditioned rooms at hotel offer a seating area and a writing desk. Private bathrooms come with a hairdryer. A TV with cable channels and a minibar are included. This hotel features 6 dining options and an outdoor pool. Overlooking the mountains, Lotus also has a fitness center and a sauna. Lotus Hotel Pang Suan Kaew Chiang Mai has 2 restaurants offering international breakfast. San Phak Wan serves international buffet lunch and a la carte menu for dinner, accompanied with live music entertainment. Lotus’s 2 other restaurants serve traditional delights and European specialties in the evenings. A bar is also available. Guests at Lotus Hotel Pang Suan Kaew Chiang Mai can use the business center or make travel arrangements at the tour desk. 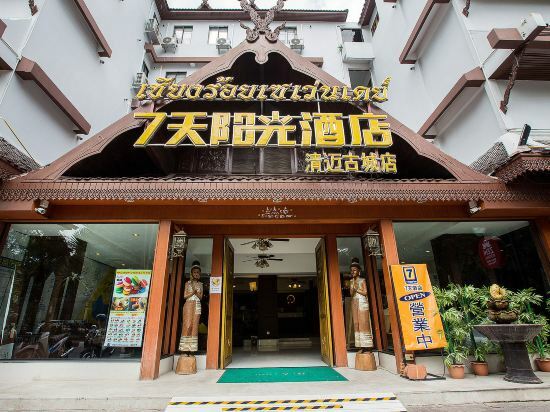 7 Days Inn Chiang Mai lies close to the heart of the city center, surrounded by night bazaars, banks and other tourist attractions. For those of you who want to venture out, Jedlin Temple, Tony's Big Bikes, Changtam Temple are just some of the attractions available to visitors. The facilities and services provided by the hotel ensure a pleasant stay for guests. For the comfort and convenience of guests, the hotel offers 24 hours Front Desk, shops, translation, Wi-F, laundry and motor rental service. Modern comforts such as shower, fan, complimentary bottled water, internet access – wireless (complimentary) can be found in rooms. The Imperial Mae Ping Hotel is located in central Chiang Mai, a 5-minute walk from the Night Bazaar. Imperial Hotel Mae ping is a 5-minute drive from Chiang Mai Train station and a 10-minute drive from Chiang Mai International Airport. The classy rooms at Mae Ping Imperial come with modern décor and offer views of the grounds/pool. Each room is well-equipped with a minibar and TV with cable channels. It offers a luxurious spa, swimming pool. Guests can work out at the fitness center or enjoy a massage at the spa. The hotel provides car rental services and free parking. Sightseeing arrangements can be made at the tour desk. 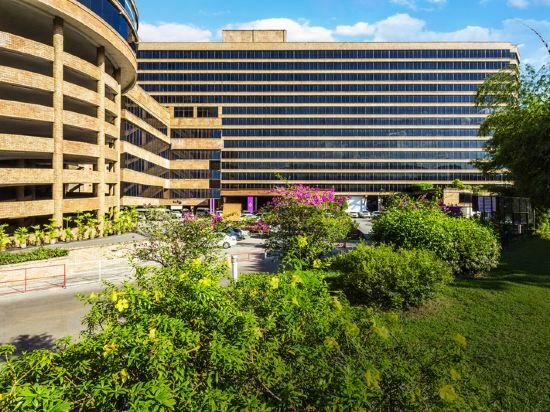 The hotel’s 9 dining options include Mae Ping Coffee Shop & Restaurant, which serves Thai and international food. Japanese dishes are available at Imperial Shabu Shabu. 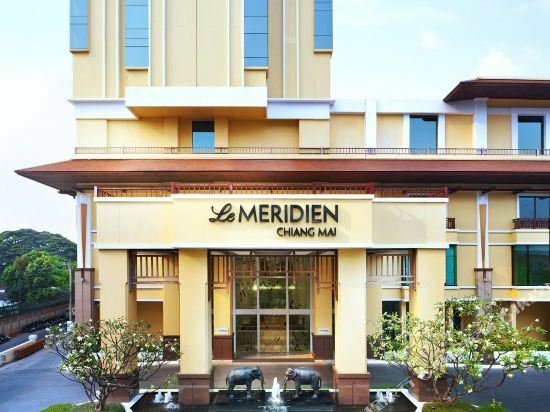 Stratigically located on Chang Klan Road, the Le Meridien Chiang Mai is situated in Thailand's northern capital central business district and provides easy access to the famous Night Bazaar and lots of restaurants, shopping and entertainment hubs, temples and places of interest. Presenting an intriguing combination of Le Meridien's European heritage and local Lanna Era style, the luxury property delivers a unique contemporary accomodation experience for guests' Thailand vacation. All the sophisticated guest rooms offer stunning views over the majestic Doi Suthep Mountain and are a wonderful blend of historical and modern hi-tech touches, including glass and marble bathrooms with massaging rain showers, high speed internet access, and the exclusive Le Meridien beddings. Guests can choose to dine in any of the on-site restaurants that offer a variety of dining experience inspired by local and Western culinary. Exotic cocktails, fruit infusions, wide range of coffees and a selection of light snacks are also served at the bars. The property provides spacious meeting spaces for various corporate meetings, conferences, seminars, parties, wedding receptions and gala dinners. The hotel offers an excellent recreational choices for guests' mental as well as physical well being. They can choose to work out in the well-equipped gymnasium, which houses the latest cardiovascular equipments, unwind with various healing massages, body spas and holistic therapies or enjoy the sunlight with a cool drink by the swimming pool, which is set against panoramas of the city and mountain. Movenpick Suriwongse Hotel Chiang Mai is an ideally contemporary "Lanna" Thai style hotel with the charm of Chiang Mai's unique culture, located in the heart of the city just a step to Night Bazaar, the famous shoppers' paradise and weekend walking street. It is about a 15-minute walk from the historic temples in Old Chiang Mai town. It is a 10-minute drive from Chiang Mai International Airport and has free parking. Overlooking the Doi Suthep Mountain Range or city, rooms feature dark wood furnishings with modern Thai-style interiors. Fuengfah Restaurant offers a buffet breakfast, Thai dishes and nightly live entertainment. European and Mediterranean specialties can be sampled at Le Bistrot Restaurant. Stay in Movenpick Suriwongse Hotel Chiang Mai would offer you the wonderful touch to the Thai culture and experience in Chiang Mai. The second largest city in Thailand and economic center in the northern part of the country, visiting Chiang Mai is quite a different experience when compared to visiting Bangkok. As the former capital of Lanna Kingdom, Chiang Mai surrounded by mountains and full of tradition. Here, the climate is cool and flowers bloom during all four seasons. The city is full of ancient temples with white walls, red roofs, and golden cornices, exuding a style of architecture that is unique to the area. Monks can often be seen in the temples and are quite friendly to visitors, often engaging in discussions about Buddhism and the local culture. Chiang Mai Old City is a neat square area surrounded by moats. The main attractions in the Old City are: Wat Phra Singh, the Big Buddha Temple, Wat Phan Tao, Wat Chiang Man, the Chiang Mai City Arts and Culture Center, Anusawari Sam Kasat, and the Sunday Market. The Tha Pae Gate, Chiang Mai Night Bazaar, Chang Khlan Road, Talat Warorot and Mae Ping River are located east of the old town. Thanon Moon Muang Street is located along the moat in the east as well and is home to many cheap Chiang Mai hotels and restaurants. The Chiang Mai Post Office and Chiang Mai Railway Station are both in this direction too. The Suan Dok Gate, Wat Suan Dok, Chiang Mai University, The Nimmanhaemin Art District, Chiang Mai Zoo, Wat Umong, Chiang Mai Night Safari, and Doi Suthep-Pui National Park are located in the west of the old city. In the south, visitors can find the Chiang Mai Gate, Suan Prung Gate, Saturday Bazaar, and the Sbun-Nga Textile Museum. Chiang Mai International Airport is in the southwest of the old city. Chang Puak Gate, Wat Ku Tao, Wat Jet Yot, Chiang Mai National Museum, Chiang Mai Stadium, Huay Teung Thao Reservoir are all located in the north. The period from October to February is peak tourist season in Chiang Mai. During the cool seasons from November to March, Chiang Mai's climate is very pleasant. It is moderate in temperature and rarely rains, but at night, it might be a good idea to carry a light jacket. From February to March each year, the air quality is poor because farmers often burn fields on the mountains to prepare for the growing of new crops during this period. The rainy season generally lasts from June to October, though its impact on Chiang Mai is smaller than that in the central and southern Thailand. During the rainy season, the air is cool and the scenery is beautiful, but rain often comes without prior notice. It’s important to note that the rain during this time may affect the city’s night markets. During this period, please pay special attention to the weather forecast and carry rain gear. Although Chiang Mai is a relatively small city, the tourism service industry is very well developed. There are many hotels in Chiang Mai of various grades. The old city of Chiang Mai is the preferred accommodation area for tourists because of the local temples and night markets are located her, and there’s easy access to transportation, dining, and entertainment. Staying here, you can really feel the leisure and kindness of Chiang Mai. 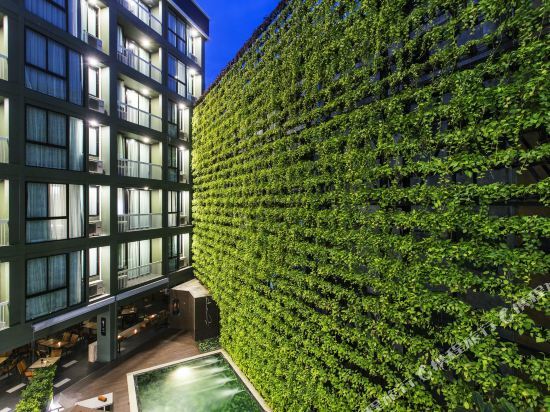 If you want to find a quieter place to stay, you might choose hotels located near Chiang Mai University and Nying Man Road where there are also many stylish shops. There are many well-known hotels near the Changkang Night Market and on the banks of the Mae Ping River. 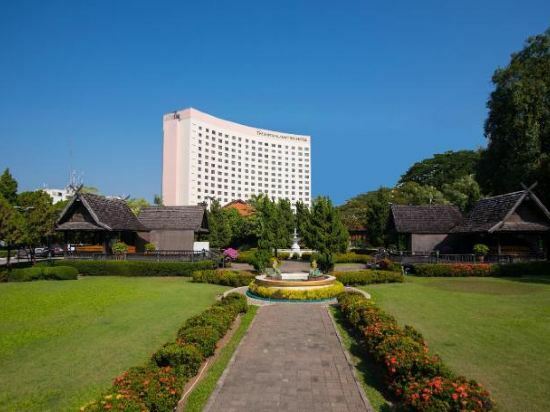 Chiang Mai hotel information & deal: Check out room rates, photos, a map and reviews of hotels in Chiang Mai and find the best deals on Chiang Mai hotels. Trip.com offers big savings on online reservations for Chiang Mai accommodation. Book Chiang Mai vacation packages and Chiang Mai tours with huge discounts on Trip.com!